While many view legislators as hopelessly out-of-touch curmudgeons, I am happy to report that one Louisiana official is unafraid to tackle the unpopular issues that threaten the very fabric of our society. Caddo Parish District 3 Commissioner Michael Williams has vowed to push through an ordinance that would ban citizens from wearing pajamas in public. The legislation was inspired by a traumatic incident the commissioner experienced at a local Wal-Mart. Apparently Mr. Williams was out picking up a few items when he encountered a group of young men attired in pajama pants and t-shirts. Unfortunately, one of the gentleman’s garments was ill-equipped to conceal his “accessories” and Mr. Williams claims he saw the youth’s “private parts.” The experience was a pivotal moment for Michael who realized that it was time to draw a line in the sand: “Today it’s pajamas, tomorrow it's underwear. Where does it stop?" Several Shreveport residents who oppose the idea insist that this battle is for nothing less than our personal liberty. Khiry Tisdem, a local sleepwear enthusiast, told local media "I'm an American, and I can wear my clothes anywhere I want. I'm a grown man. I pay my own bills, so I can wear my clothes the way I want. I don't know why it's an issue." Even local law enforcement admits the enforcement of such an ordinance could present issues since it is difficult to define exactly what constitutes pajamas. Commissioner Williams hopes to put his proposal to a vote the first quarter of this year. I can somewhat sympathize with Mr. Williams as going to Wal-Mart is scarring enough without some random guy flashing brain at you in housewares. However, I am fairly certain that exposing your mongoose at a department store is already prohibited by existing indecent exposure laws. Perhaps just alerting a manager would have been a more prudent move. I am pretty sure Wal-Mart already has a code for that particular situation. It is also tough for me to get onboard with the “slippery slope” argument. It is as if he truly believes that allowing the scourge of loungewear to go unchecked will lead to entire families running buck-naked down the cereal aisle. 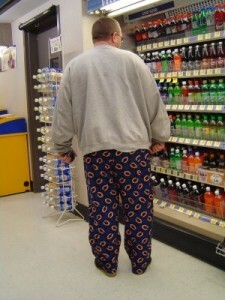 I have seen several people in Wal-Mart who I wish had been wearing something as conservative as pajama pants. I cannot help but wonder about a man willing to go on the record in order to defend his passion for drawstring sleep bottoms. It is one thing to avoid changing simply to complete an early morning errand, but it is quite another to consider your pajama pants as part of your Friday night rotation. Although to Mr. Tisdem’s credit, anyone who remains gainfully employed while specifically avoiding pants with belt-loops possesses a talent I envy. Of all the characters in the Orwellian drama, I feel the most sympathy for local law enforcement. It is not enough that they must combat actual crime with perpetually-anemic budgets and staff shortages, now they are going to have to form a “PJ Task Force.” I imagine their constituents will sleep better at night knowing “Operation Nap Time” has been given the green light. How embarrassing would it be to serve time for such an asinine infraction? You wouldn’t last through the night if your cell-mates discovered you were serving six months on a “Spongebob pajama” collar. Worse yet, you might have to cut a deal to avoid jail time but then you risk word getting around to the East Side Nighty-Nite Boys that you was caught snitchin’ on Flannel-Bottom Billy. Pretty soon they’ll find you are the bottom of the river wearing concrete house-shoes.